Reply, 'Mr Turnbull Surgeon at Wooler C. Mr & Mrs Elliot'. Mrs Elliot has a chronic catarrhal cough, diarrhœa and menstrual problems. Her husband Rev Henry Elliot is 'threatened with a rupture'. 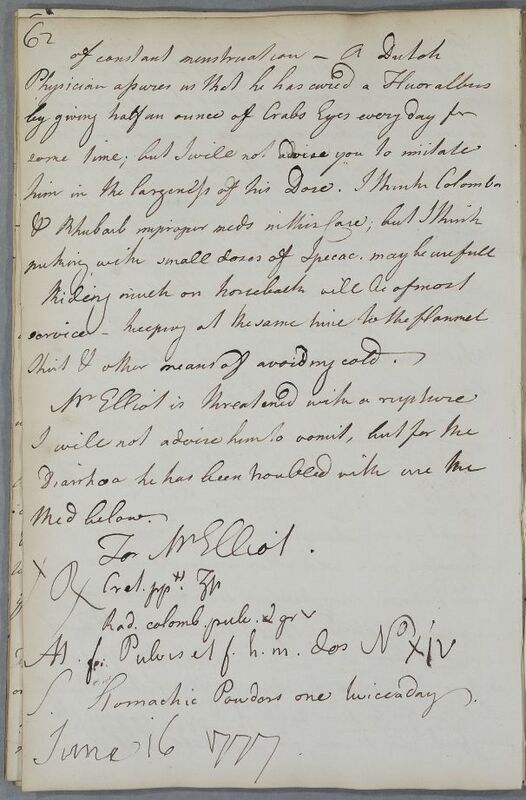 Summary Reply, 'Mr Turnbull Surgeon at Wooler C. Mr & Mrs Elliot'. Mrs Elliot has a chronic catarrhal cough, diarrhœa and menstrual problems. Her husband Rev Henry Elliot is 'threatened with a rupture'. Case of Mrs Elliot who has a chronic catarrhal cough, diarrhœa and menstrual problems. 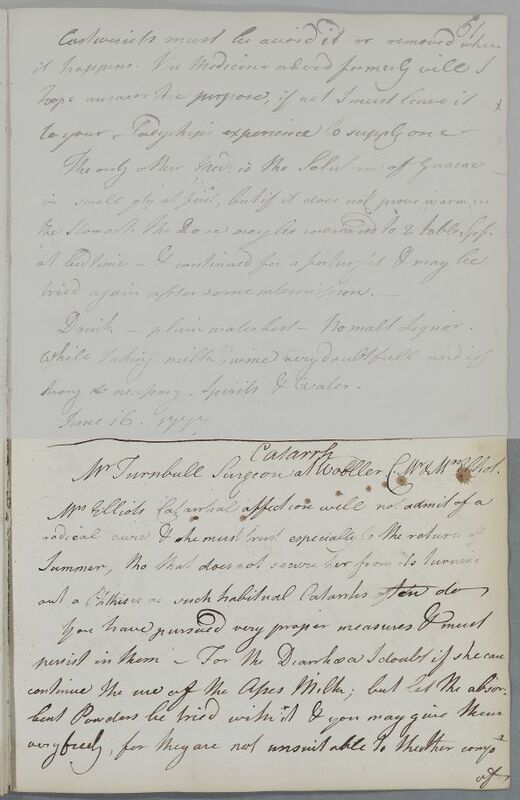 Case of the Reverend Mr Henry Elliot of Fowberry who suffers from a bad stoamch, 'heats' and other 'nervous' symptoms which are exaccerbated by the loss of his wife. Mr Turnbull Surgeon at Wooler C. Mr & Mrs Elliot. shirt & other means of avoiding any cold. Take ½ an ounce of prepared Chalk and 5 grains of powdered Colombo Root. Mix to make a powder and in this way make 14 doses. Label: Stomachic Powders one twice a day. 1: Possibly an allusion to the famous Dutch physician and botanist Herman Boerhaave (1668-1738). S. Stomachic Powders one twice a day.